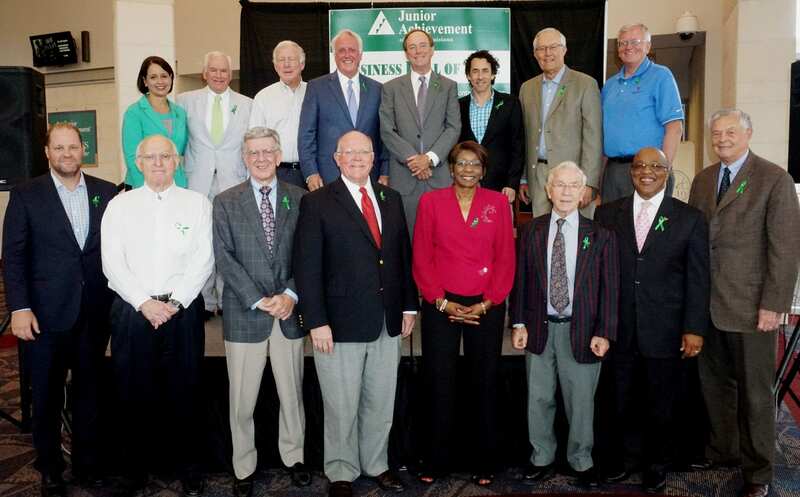 Many of the areas’ finest business leaders gathered on Tuesday, August 22nd to hear the announcement of the 2016 Junior Achievement, North Louisiana Business Hall of Fame Laureates. Since 1994, JA supporters have celebrated the accomplishments of newly selected JA Laureates, recognized for their ongoing contributions in the community. This year’s announcement, held in the rotunda at the Shreveport Convention Center was attended by approximately forty five business leaders, twenty of whom were past recipients of the prestigious award. The 2016 Junior Achievement Laureates are Jimmy Gosslee, Chairman and CEO of Coldwell Banker-Gosslee Real Estate, Gregory Kallenberg, Founder and Executive Director of the Film Prize Foundation which includes the Louisiana Film Prize, Start Up Prize, Music Prize and Food Prize and Jon Q Petersen, the President of Marlin Exploration and Petersen Enterprises. Each of these fine citizens have served on many not for profit boards for the sole purpose of helping our community thrive. Each of these new Laureates also have a heart for the young people of our community and understand the importance of teaching money management, work skills that will prepare them for today’s world of work and want to inspire new entrepreneurs to move North Louisiana forward. The 2016 JA Laureates will be inducted into the 22nd Annual JA Business Hall of Fame on the 27th of October. JA helps students realize that the education they are getting today will help them to have a bright future tomorrow. JA’s unique, volunteer delivered programs show them all of the possibilities that lay before them. Volunteers are encouraged to share their real life work with students—to tell their stories of how their own education has helped them succeed. Students realize they can choose different paths; college, a specific trade or start their own business. Since 2013, JA has increased the number of JA classes available for middle and high school students. In May, the Louisiana Department of Education announced the state’s four-year high school graduation rate increased for a fifth consecutive year in 2015, reaching an all-time high of 77.5 percent for the 2015 graduating class. Junior Achievement programs encourage students who may contemplate dropping out by connecting the dots between classroom learning and success—helping students understand the importance of staying in school. After participating in Junior Achievement, 92% of JA students report that they have the confidence to achieve success. A activities support increasing social competencies, skills regarded among the most crucial to finding a job and keeping it. And, 91% of millennials wish they had greater access to entrepreneurial education programs. The proceeds from the JA Business Hall of Fame Induction Dinner fund JA lessons in money management, workforce readiness and entrepreneurship for students, kindergarten through high school. Last year, 7,203 students had the opportunity to experience JA’s hands-on programs using activities to create opportunities for collaboration, communication, creativity and critical thinking in every lesson. As Nita Cook, president of JA explained about the JA Laureates, “they do not need this accolade, but unselfishly accept the invitation because they believe in JA’s mission. Selected by their peers to be inducted into the JA Business Hall of Fame, they will use this honor to help raise awareness of the need for Junior Achievement lessons in our classrooms. They willing lend their clout to make sure young people understand finance, are ready for college or career studies and ultimately, hope to ignite the spark of entrepreneurship in young students in our own community. JA Laureates solicit funding for JA lessons from their peers and business associates and make a conscious effort to support and elevate the dreams of students in North Louisiana. The combined economic impact of JA’s volunteer hours and JA program materials provided to our community in last school year was $1,325,140. This year, we will offer lessons to 9,600 students with a projected economic impact of $1,860,833. To make this possible, hundreds of community volunteers, foundations, businesses and other not for profit organizations partner to support JA’s mission and we welcome you to join our team. As a volunteer, you can show students what success looks like by sharing your own experiences. It’s easy for you and life-changing for them.